So Jesus came to them and said, "All authority (power) in heaven and on earth is given to me. So go and make followers of all people in the world. Baptize them in the name of the Father and the Son and the Holy Spirit. Teach those people to obey everything that I have told you. You can be sure that I will be with you always. I will continue with you until the end of the world." That last hug. That last kiss. That last look. That last wave. Each of them is very important when you are leaving someone you love, especially if it could be the last time you see them for awhile. But the last word, that one last message, is precious. You try to make it pleasant ... you try to make it memorable ... you try to make it affectionate ... but most of all, you want your one last word to count! 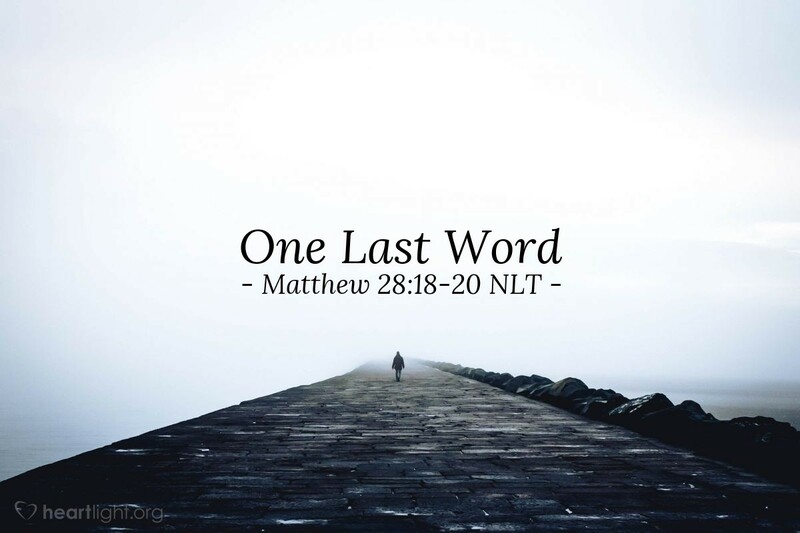 The Great Commission is Jesus' last earthly message to his disciples in the Gospel of Matthew. While Jesus still leads and guides, this is the message he wants his disciples to remember as his parting command. This is his final message. He stresses emphatically that it is based upon his authority over everyone and everything and everywhere. What is that message? GO MAKE DISCIPLES! Notice Jesus doesn't want us running all over the place telling about him. Notice he doesn't just want us baptizing everyone we see. Notice he doesn't just want us to teach others to follow him. He wants us to do all three! Go, baptize, and teach to obey so they will be my disciples, too! If we heed these marching orders, if we get out of the shadow of our church buildings and culture, he will go with us! That's it. That's Jesus' one last word. It's also our first word! Almighty God, I know you sent Jesus so the world could be saved. I know that means more than just them hearing about Jesus. I know you want people to be true followers, to be disciples. So forgive us, Father, for the times we have procrastinated because we worried the job was too big, too hard, too expensive, and too personally demanding. We will try, I will try, to be more excited and generous with sharing the Gospel with others in this coming year. I know as I do, Jesus will go with me. So may this next year be to your glory and to Jesus' honor and praise! In the mighty name of Jesus I pray. Amen.